Hello All. I definitely wish I could have been around more this week, but its been cray-zay. And now that I am sitting down in my most favorite spot I'm suffering from acute writers block. Mainly because I'm not really a writer. Yes, the jig is up. So please help me by telling me what you like to read about the most here. Interviews? (I'm thinking of a certain chef I'd like to get my hands on) News in the biz? Have you got any funny stories for me? Talk to me! Congrats on making Grub street!!! I just found this blog on NYMag and it made me so happy! I've been dating (and now living with) my chef for 2.5 years. None of my friends can relate to my life so I'm happy to see there are a bunch of other girls out there in the same situation as me. If you're doing interviews with chefs, I would love to hear what they have to say about their significant others and what it means to have such supportive, understanding, fabulous women in their lives like us! Thanks Foodie! ...aw you noticed! Hey Chefdater...you HAVE TO tell me who your man is! Those places on dining and whining are my most favorites. I'm glad you like the blog! 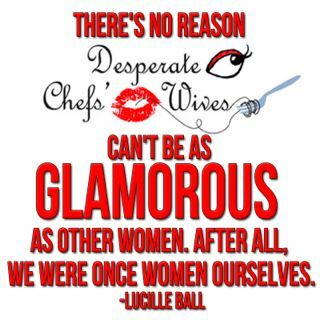 Email me-the other Desperate Chefswives would love to have you with on a lonely saturday night! 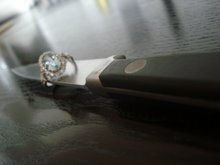 I would love to hear stories from other chef-significant-others/wives, especially EX-significant-others/wives. I love my chef very much and trust him, but I don't trust his other chef friends! Almost all of his closest chef friends have cheated on their wives or girlfriends, so there's always that lurking in the back of my head. Ultimately, though, it always comes down to the strength of our relationship, and I have utter faith in us. It doesn't hurt to keep my eyes open, though! oh, and maybe also stories about our chefs doing test runs on new recipes at home? Once my chef was trying his hand at Spanish tortilla de patatas, and I think we had maybe four or five that week. Plus a brand-new nonstick pan. I was enlisted to peel lots and lots of potatoes. I would like to hear how everyone sustains a healthy marriage and raise children when the chef is absent most of the time? Does it wear on the family and marriage after awhile? Good ideas! Look for them soon! 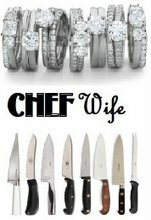 Maybe this is silly, but a "You know you're married to a chef if..." list would be fun to compile. My husband recently forwarded me an email with "You know you're in the hospitality industry if..." list which was funny enough, but I bet we could come up with our own version. Campy, yes. Silly and juvenile? Probably also. But true, dammit.